The evening show from our campsite. We look forward to the sunsets every night. 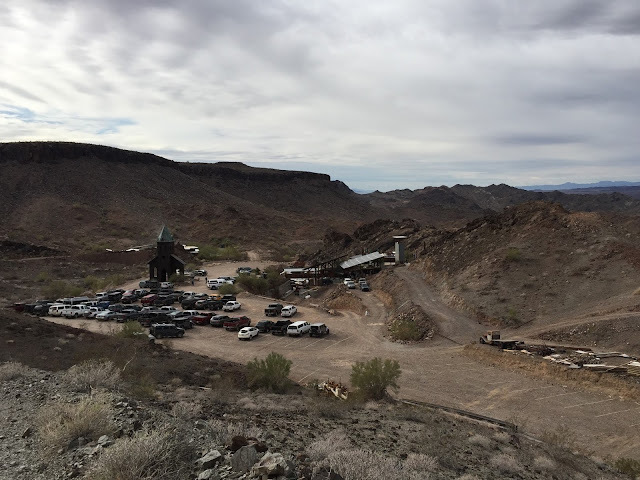 We had so much fun in Quartzsite last January, we decided to make a return visit. 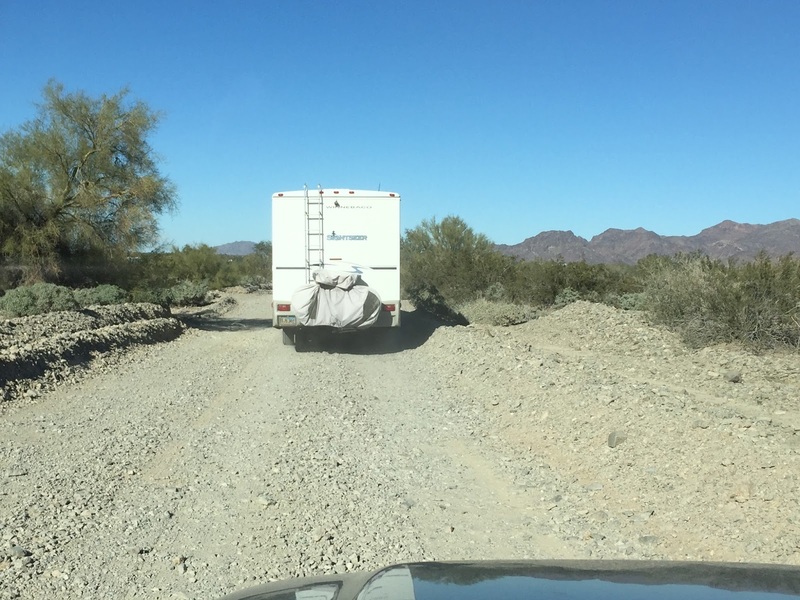 This year we boon-docked out in the Quartzsite desert with the Escapees, an organization made up of RV'ers, many are full-timers. The Boomers (baby-boomers) are a group within Escapees, they have been boon-docking in this same desert spot for years. Also known as Boomerville. Shake, rattle and roll....a bumpy rocky desert road on the way out to Boomerville. I had a few things fall off the counter that have never fallen before. Boomerville...we're camped to the left behind the small Palo Verde trees. We had a great time at Boomerville, met many fun people and some old friends we had met previously on the road. This is a very active group, there was always something going on. Many of the saguaros in this area looked like they were dying, not sure if it's from natural causes, past droughts or disease. This one however was most beautiful, especially in the late afternoon sunlight. We were impressed by the circumference of it's trunk. "Live for the moments you can't put in words." 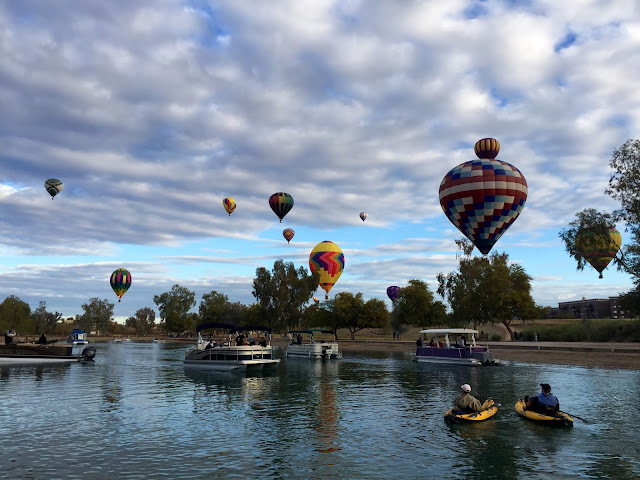 We enjoyed the Lake Havasu Balloon Festival so much so that we're seriously thinking about going to the Albuquerque Balloon Festival in October. This shot was taken from our camping area. Saturday was windy and rainy... a no fly day, disappointing. But Sunday made up for it, we awoke to this beautiful morning, balloons were up at sunrise. 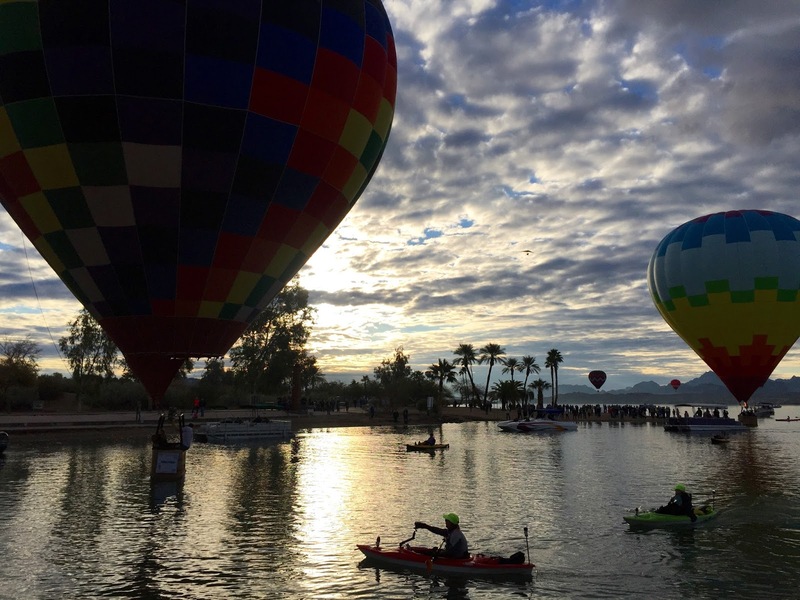 Sunrise over Lake Havasu. Pilots thrill on-lookers by touching their baskets on the water. 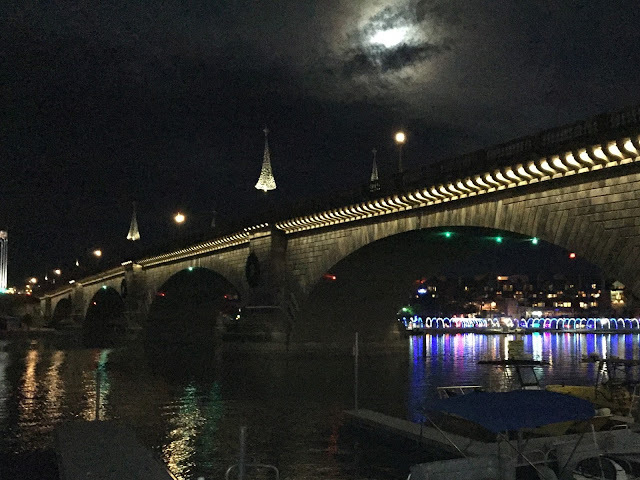 Lake Havasu is a beautiful city to visit. There are walking trails and nice parks on both sides of this channel which we took advantage of daily. The London Bridge crosses over the channel. An evening at the London Bridge. Interesting history...this is the original London Bridge from England. London planned to replace the bridge when it was falling in disrepair, a businessman and founder of Lake Havasu bought the bridge in 1968. 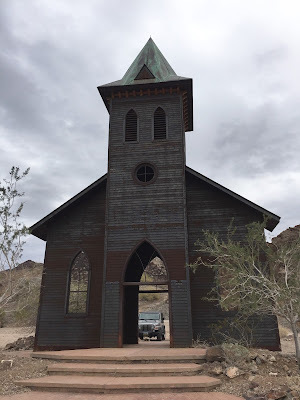 As the bridge was torn down, each granite brick and was numbered and charted, it was shipped to CA then trucked to Havasu where it was reassembled. The bridge was dedicated in 1971, it's a big attraction for tourists who appreciate it's beauty and to walk across the historic London Bridge. The bridge also serves as access to a good sized island where we camped. The ballon festival was also on the island. The Desert Bar...very unique and so worth the drive into the Buckskin mountains on a rough desert road. It was built from the ruins of an old mining camp. It's been a labor of love for the owner/builder who has spent years adding to what began as a small "watering hole". The saloon is on the right, the slanted roof is solar panels. The saloon is completely powered by solar, it is only open Saturday and Sundays from noon until sundown. The owner lives on the property so visitors are only welcome when the saloon is open for business. Weather was a bit iffy this day, but no rain. After having a bite to eat and listening to the live music, we hiked around the surrounding hills where evidence of old mining can be seen. Another creation at the Desert Bar is the iconic steel church. It's basically a walk-thru arch with a steeple, it's very cool looking from a distance. 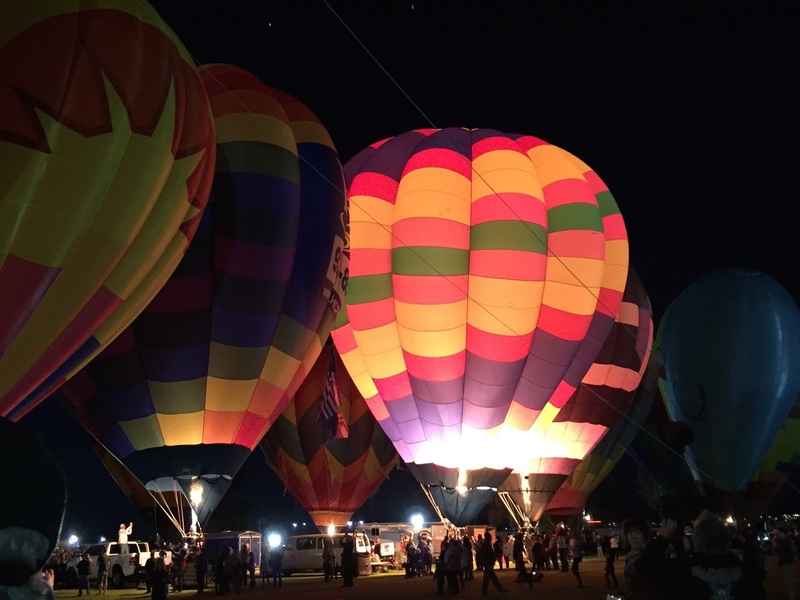 The pilots fill their ballons and at a set time the music starts and the announcer gives the word to "light em up". 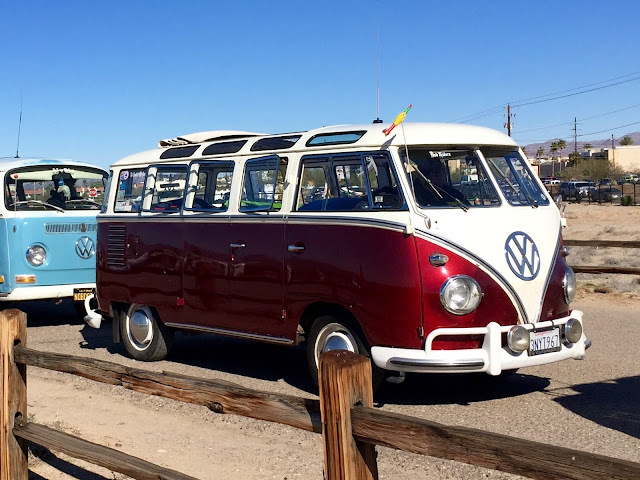 Another event on the same weekend was "Buses at the Bridge", VW owners with their buses camp at the state park by the London Bridge. It's a weekend car show of VW buses dating back to the 1950's. I've always had a fondness for VW's of any kind. This bus was very cool with it's matching pull behind trailer. There were also buses that looked like rust buckets but they still had charm and character. We stopped by on Sunday when the show was wrapping up, perfect timing...was like a parade as we watched all the buses heading out. How cool is this bus...love the windows and sun roof. All from Lake Havasu...next stop Quartzite and boon-docking at Boomerville.